Plants are the Strangest People: Pretty pictures: Pink and Red Pelargonium cvv. 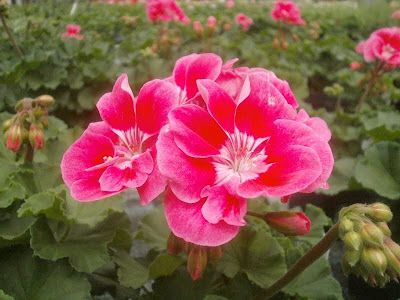 Pretty pictures: Pink and Red Pelargonium cvv. One nice thing about the new camera (which isn't even new anymore; I've had it more than a year): it appears to be capable of taking pictures of Pelargonium flowers. The old one always gave me over-saturated colors that obscured the details. 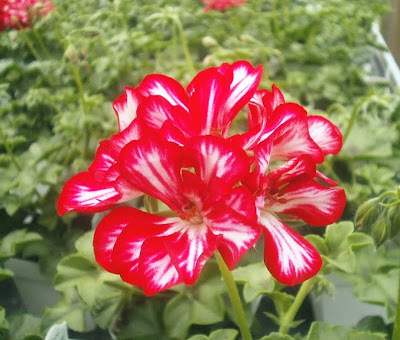 I go back and forth about Pelargoniums: when I started at the garden center, I liked them. After I'd been there a while, I hated them, especially the smell of them. (I considered writing a profile around the "person" of Newborn, or Infant -- they have very rounded features, they frequently smell funny, and everybody was always talking about them as though they were super-delicate. It still kind of makes sense to me.) Since leaving the garden center job, I've been appreciating pels again. 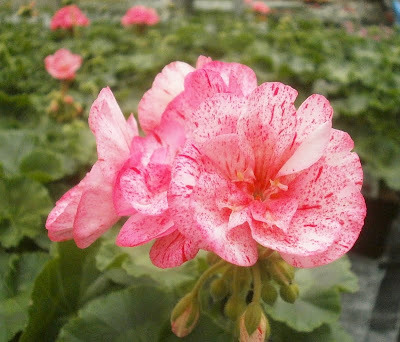 Why absence makes the heart grow fonder with Pelargoniums and not Phalaenopsis, I don't know. I only actually own two pels. One is a 'Vancouver Centennial' that I've had for about two years. I can rarely give it enough light to get the leaves to color up properly (it's an inconvenient size, and competition is fierce for the high-light spots), but it's otherwise been agreeable. The other, 'Mrs. Pollock,' only arrived a couple weeks ago (one of only TWO plants I've bought in the last two months, the other being the Rhipsalis I posted about a while back -- such superhuman restraint! ), and all indications are that it's going to have the same problem. I hope to work something out that everybody is okay with. Nina and I are currently sorting through everybody's applications for one of the coveted outdoor positions this summer (yes, the plants fill out paperwork. We all get paperwork here. ), and Mrs. Pollock makes a strong argument. We'll see. I love the mental picture of you and Nina looking through the plants' applications! "Why I Deserve the Front Porch," an essay by Mrs. Pollock. 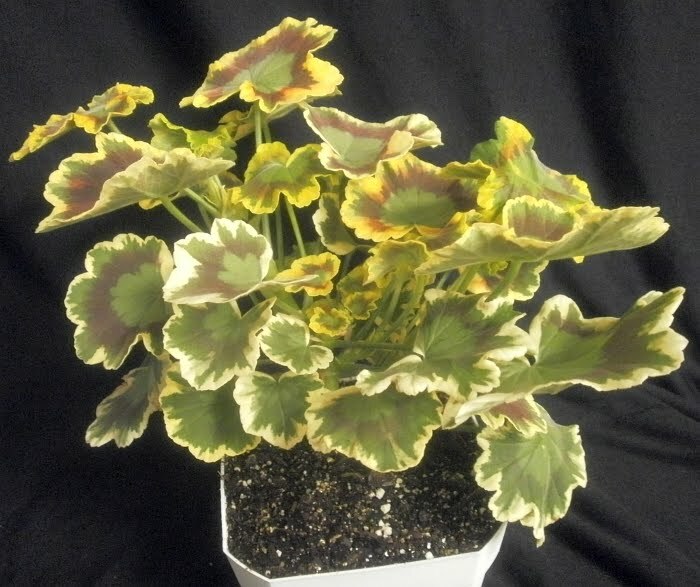 As for Pelargoniums, I can tolerate the upright ones (I have one myself, though I keep it more for sentimental reasons that because I actually like it), but the ivy-leaf types... ugh. Even having ivy in their name can't make me hate them any less - the only plant I hate more are wax begonias! I'd sooner fill all my windowsills with Phals before allowing one of those pelargoniums anywhere in the Nettle Nest! I like this profile idea. they're not that interesting, until you have one of your own. I tried a Mrs Pollock one year, but was inexperienced with Pelargoniums; too little light and too much water later and it didn't make the summer. Now I *think* I've learned from my mistakes, and I'm trying two new varieties this year (well, new for me); they're the ivy x zonal crosses, one is Caliope Red and the other is Caliente (I want to say Orange ... it's orange-y). Crossing my fingers ... they already look like they fill out baskets better than just the zonals, judging by what's coming into the nursery.